This update to Universal Audio’s plug-in catalogue includes several mouthwatering delights! I always look forward to seeing what new plug-ins Universal Audio will add in each update to their UAD system, and the v9.3 selection is a real treat. As well as adding Korg’s classic SDD-3000 digital delay, as used by The Edge, we get the quirky Dytronics Cyclosonic Panner as modelled by Softube, the ENGL Savage 120 guitar amplifier (with Unison support for Apollo owners), the Sonnox Oxford Dynamic EQ (see review in this issue) and the AMS RMX 16 Expanded algorithmic reverb. The update also brings with it Unison support for the existing ENGL amplifiers. Launched way back in the early ’80s, Korg’s 13-bit SDD-3000 had been discontinued for many years until the company resurrected it as a pedal in 2014 — check out our review of that at www.soundonsound.com/reviews/korg-sdd-3000-pedal if you’re unfamiliar with the device. 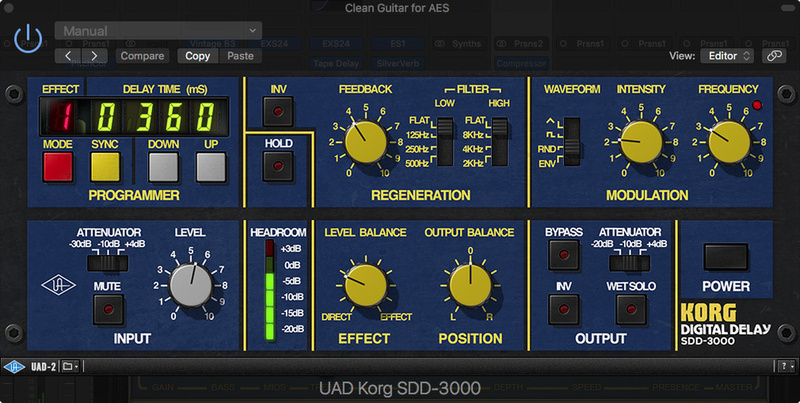 This Korg-licensed UAD interpretation has a rack-style GUI complete with numerical display of the delay time, switchable high- and low-cut filters and a modulation section offering a choice of triangle, square, random or envelope-follower modulation waveforms. There are also switchable input and output attenuators, which are important as they allow you to determine how hard to drive the plug-in — the preamp drive characteristics of the original have been replicated. Support for UA’s Unison preamp modelling technology is also included, and replicates the high-impedance input of the original hardware. The delay circuit of the original operated at line level, with an extra gain stage added when the -30dB setting was selected; this was a key part of the unit’s signature sound. In most other respects, the controls offer what you’d expect from a digital delay including a polarity inversion switch for the feedback and a Hold switch to keep the delays going ad infinitum. Additionally, you get all the tempo-sync and rhythmic subdivision options you’d expect from a modern DAW-hosted delay plug-in as well as mono, dual-mono, stereo and mono-in/stereo-out operation. If you don’t invoke tempo sync, the delay time is manually variable up to 1023 milliseconds, as on the original. The modulation section is powerful enough to stray into chorus territory, but used more subtly it adds a very textural dimension to the delays. The end result is satisfyingly organic, and it is easy to see why the original units are so revered. Modelled here by Softube, the Cyclosonic Panner dates back to 1984 and was sold and branded both under the Dytronics and Songbird names. While the heart of the unit is a two-channel panner, there’s additional EQ, enhancement and phase shift going on to give the pan more of a 3D feel. For me it doesn’t create much of a surround-sound effect, but it certainly has more perceived depth than a conventional panner. Considering how long ago this piece of kit was designed, its panning modes are actually very sophisticated, and sound far more interesting than straightforward automated panning. Panning can be triggered manually or from ‘above threshold’ input signals, or controlled by an LFO with a choice of waveforms and a DAW tempo-sync option. Two LED displays show the pan movement and position: simple panning follows the horizontal centre line and 3D panning the circular ring. Three panels of buttons set up triggering, type of panning and stereo output mode. Knobs set the Rate, Waveform, Width and Depth of the pan effects, with a further knob at the right-hand side to set the output level. If used in mono, the unit creates tremolo or chopping effects, and if the input is stereo, only the left-hand channel is used in mono mode. 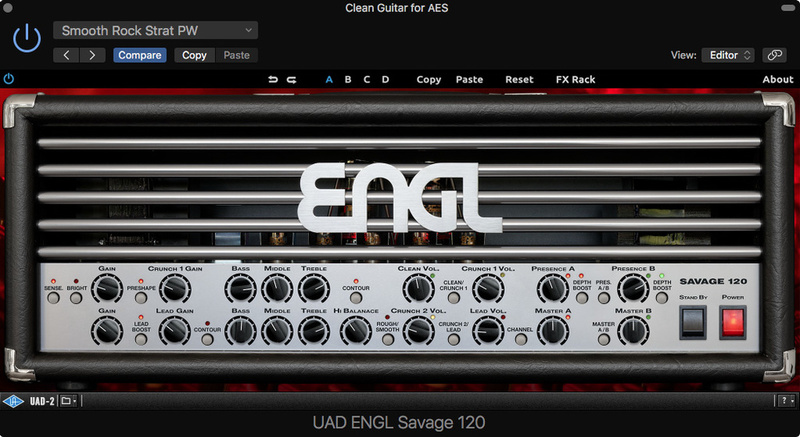 Again supporting Unison for Apollo users, the ENGL Savage 120 valve amp head is tonally very versatile, though as its name might suggest, its focus is on modern metal — in which capacity it can deliver some very heavily overdriven sounds. This plug-in was created using component-level modelling by Brainworx, who have also added their own FX Rack, which includes a range of speaker cabinet impulse responses recorded through their own Neve console, plus noise gate, delay and internal power soak. The ENGL Savage 120 valve amp head.The amp itself is a two-channel affair where the upper channel can be switched between Clean or Crunch 1 modes and the lower between Crunch 2 and Lead. Each drive type has its own separate gain control followed by EQ, separate volume controls for each drive type, A/B-switchable Presence controls and A/B-switchable Master volume controls. The Bass, Middle and Treble EQ sections plus Dual Presence controls work in tandem with separate Contour switches for the upper and lower channels, an input Bright switch and some EQ pre-shaping switchable for the upper channel. There’s also an overall input Sensitivity switch plus Lead Boost and Rough/Smooth tone shaping for the lower channel, and a Hi Balance control that operates only when Smooth is selected. Despite its metal leanings, the Savage 120 is capable of delivering cutting mids without abrasive highs, and it reacts well to playing dynamics and guitar volume control adjustments. Furthermore, the power amp section can be bypassed if you fancy combining the preamp with another plug-in. However, this probably isn’t the best choice of amp for country pickers! Its clean channel goes from barely clean to nicely smokey, but after that it’s grit and grind all the way down to solid bedrock. In practical terms, you can expect to go from classic rock to just about any style of metal, with plenty of tonal fine-tuning on offer. I have a soft spot for the AMS RMX16 as it was one of the first products I reviewed when I took up this writing lark with Home Studio Recording magazine back in 1984. It was claimed to be the world’s first full-bandwidth (20Hz to 18kHz), microprocessor-controlled digital reverberator, and found its way onto lots of classic ’80s records. The algorithmic engine at its heart was fine-tuned by ear and the machine gained a reputation for sounding very musical. UA already offered a comprehensive emulation; in this expanded version, the original nine reverb programs have been augmented by an extension set of nine more, originally an option that required the RMX16 remote control with barcode reader input to load. Mark Crabtree of AMS Neve, who designed the original, worked with UA ensuring that the plug-in used the same reverb and delay algorithms as the original hardware. Anyone who already has the original UAD RMX16 plug-in can upgrade to the expanded version for $49. While the programs on offer cover ambience, rooms, halls, plates, delay, chorus, non-linear, infinite and reverse variations, they initially sound very ‘safe’ compared with what is on offer today, but there’s no denying that they have a distinctive character, especially when applied to retro drums and drum machines. Back then there was far less processing power available, and 16-bit conversion would have been considered the height of sophistication, but sometimes the coarseness imparted by those restrictions adds to the character, just as the vagaries of tape made those old delay units sound so interesting. Certainly the market in used RMX16s shows no sign of drying up despite the high prices they still fetch. The extra nine programs don’t stray too far from the core capabilities of the RMX16 but do expand its capabilities to a useful degree. Add into this the very capable Sonnox Oxford Dynamic EQ (reviewed separately this issue), and once again UA have come up with a very attractive package of plug-ins, many of which showcase the advantages of the Unison support in their Apollo interfaces. If you’re on a limited budget, it might be hard to choose, but fortunately you can demo each of the new plug-ins for two weeks to help you decide whether you can live without buying them or not. 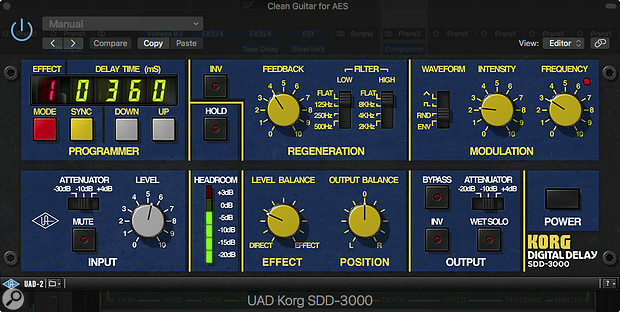 STOP PRESS: Universal Audio released UAD v9.4 after this review went to press. Full details here. The Sonnox Oxford Dynamic EQ is also available as a native product and the Korg SDD-3000 is available in pedal format, while SoundToys’ PanMan models a number of vintage auto-panners including the Cyclosonic model. Excellent emulations of the original hardware, with sensible adaptations for the DAW environment. Only that you won’t get the benefits of Unison support unless you have an Apollo interface. This update is petty much what we’ve come to expect from UA: more meticulously recreated vintage gear plus the occasional taste of something new and genuinely useful. Korg SDD-3000 £149; AMS RMX16 Expanded £260; Sonnox Oxford Dynamic EQ £189; Dytronics Cyclosonic Panner & ENGL Savage 120 £115 each. Prices include VAT. Korg SDD-3000 $199; AMS RMX16 Expanded $349; Sonnox Oxford Dynamic EQ $249; Dytronics Cyclosonic Panner & ENGL Savage 120 $149 each.